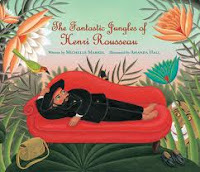 Michelle Markel’s captivating picture book biography, The Fantastic Jungles of Henri Rousseau will complement any art appreciation class for school-age children, for there is much to savor in this introduction to French Post-Impressionist painter, Henri Rousseau.(1844-1910). Markel begins with, “Henri Rousseau wants to be an artist. Not a single person has ever told him he is talented. He is a toll collector. He’s forty years old. But he buys some canvas, paint, and brushes, and starts painting away.” How refreshing to read about someone who was not easily dissuaded. Told in a lively tone, readers will learn how this humble man, who deeply loved nature, worked very hard to become an artist. Too poor for lessons, Rousseau taught himself to draw by studying the paintings of his favorite artists and by using books, magazines, catalogs, and postcards to learn anatomy. I always assumed Rousseau traveled widely, painting what he saw. Not so. Henri got inspiration from gardens, cemeteries, anyplace, even a hothouse, to create his wonderful jungles. Never, ever, throughout his whole life, would Rousseau leave Paris. And, despite year after year of negative responses to his paintings from experts, Rousseau never gave up. He continued to paint, until finally, at age sixty-one his true talent is appreciated by a much younger art community. He is befriended by those younger artists, Picasso throws a banquet for Henri, and after his death is recognized as a self-taught genius of high artistic talent. Complimenting the text are illustrations painted by Amanda Hall. Done in both watercolor and acrylics, her colorful paintings are large and give readers a sense of the joyfulness, and happiness Rousseau must have been feeling each time he painted. The paintings represent what is being discussed in the text, though I did not understand the significance of the painting showing the critics as both men and jungle animals. Overall, with the guiding hand of an art teacher, this book will show students how Amanda Hall’s illustrations add a twist to some of Rousseau’s famous paintings. The illustrations are very beautiful. Librarians, parents, and teachers will find it helpful to see in the illustrator's note the black & white sketch where Hall names the famous Avant-garde artists present at Henri's banquet. Students will respect Rousseau’s deep love of nature, while others will admire the fact that Rousseau followed his dream undeterred by the negative feedback. Adults will find it wonderfully refreshing to be reminded that age is no barrier in pursuing a long-hidden dream. In the author's note, we learn that Rousseau never enjoyed financial success. Like some artists, it was only after his death that his art was truly appreciated and given the worldwide attention it deserved. To round out the reading experience of this book, have on hand a book that contains Rousseau’s paintings and a computer with the Internet to visit the official web site of the Louvre Museum. For more information about Henri Rousseau, click here. 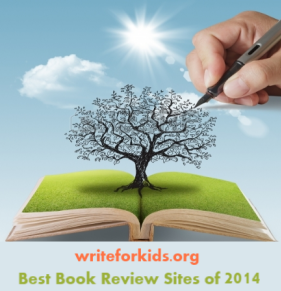 To watch the charming book trailer done by the publisher click here. A great addition to all fine arts collections in both public and school libraries. 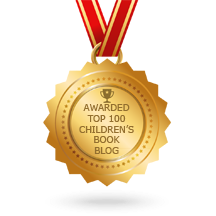 Pair it with the book (not the movie) of Framed by Frank Cottrell Boyce, which is a terrific story about the power of art.